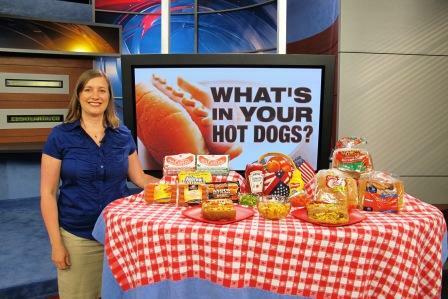 This morning I appeared on CBS Better Mornings Atlanta for Applegate Farms to discuss “What’s in your Hot Dog?” and ways to boost the nutrition factor when eating hot dogs in anticipation of 4th of July and National Hot Dog month in July. Did you know that last summer alone, people in Atlanta bought over 6.5 million hot dogs and 600,000 the week of Fourth of July??!! That’s a lot of hot dogs and there are better choices to cut down on calories, fat and sodium. I love Applegate Farm products and decided to work with them because their products are in line with my nutrition philosophy. Who doesn’t want to feel good about the meat they are serving their family and know/understand all the ingredients in the list? The Super Natural Beef and Turkey hot dogs are both organic, raised without any hormones or antibiotics and have simple ingredients. They contain half the fat of normal hot dogs and considerably less calories and sodium as well. But most importantly, they taste great too! Personally, I prefer the beef over the turkey but for a turkey hot dog, it is really good. The turkey are great in corn dog muffins though. If you want more information, go to Applegate’s What’s In Your Hot Dog website with some fun videos and facts. In the month of July you can enter to win a year’s supply of better-for-you hot dogs! Look for 100% whole grain or make your own! 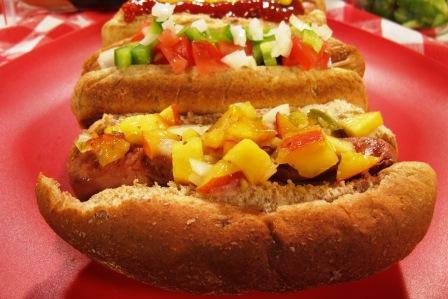 Other than choosing a better hot dog, you can also feel better about serving hot dogs by upgrading your bun and moving beyond just ketchup and mustard. 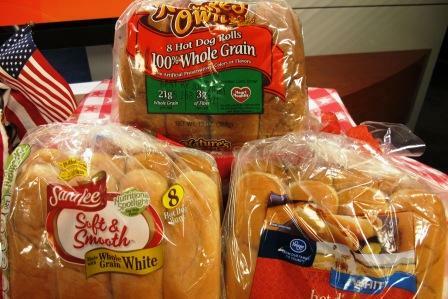 In choosing buns, look for those that are 100% whole wheat or whole grain. If your family doesn’t like the darker color of whole wheat, look for those made with white whole wheat. Often these aren’t 100% whole grain, but at least a step in the right direction to move resistant family members that way. Better yet, make your own! My Honey Whole Wheat Sandwich Buns are easy to make into hot dog buns and really don’t take much time if you own a bread maker. I only make my own now. Mustard is the most popular hot dog condiment, followed by ketchup, onions and relish. There are regional differences as well in preferred hot dog toppings. Here in the south, chili dogs are very popular. This can be made healthier by including beans in the chili and choosing better meat. 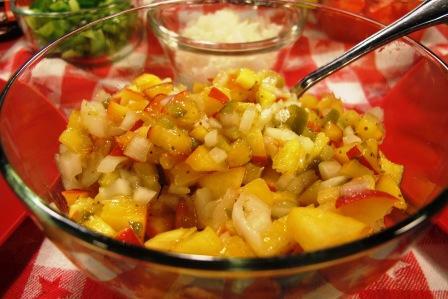 For summer though, I think relish is perfect, and nothing is more local, seasonal or Southern than my Vidalia Onion Peach Relish. It is the perfect balance of sweet, tang and heat. It has converted me from a ketchup lover to a relish lover. It is simple to make, not to mention quick too. It would also be a great compliment to grilled chicken or fish. Combine all ingredients in a bowl. Cover and chill until ready to serve. 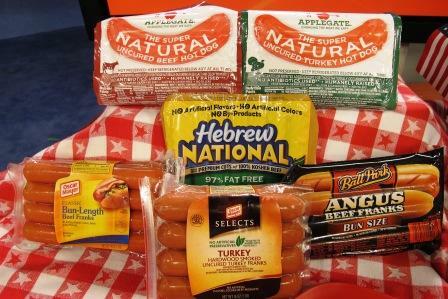 Serve on top of Applegate Farms Super Natural Beef or Turkey Hot Dogs. Note: Do not make more than 3-4 hours in advance to preserve texture and color of peaches. To adjust spiciness, add more or less of the pickled jalapeño. Disclosure: While my appearance on CBS Better Mornings Atlanta was a sponsored Applegate Farms appearance, this blog post is not sponsored by them.